The 1970’s were different times. In many ways! Some good. Some bad. Some weird. As we continue our 1979 NASL Soccer Bowl season celebrations, we also want to capture the feel of that time with a splattering of 1979 nostalgia. From old Whitecaps themed adverts to player interviews to the weird and wacky world that was the NASL, we’ll whisk you back 40 years when it was indeed different times. We kicked things off last week with an advert featuring Bob Lenarduzzi, where he captured teaching soccer skills with his love of drinking milk! 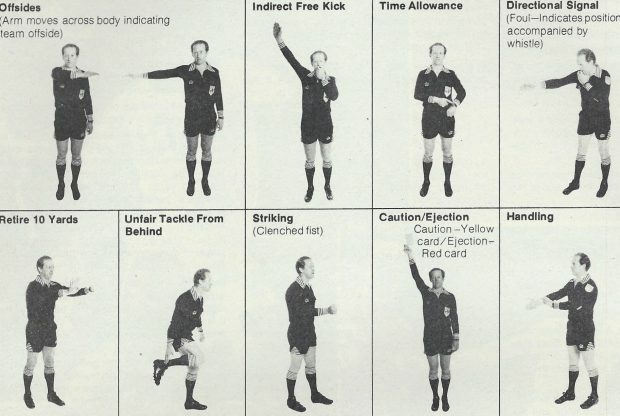 This week we get right onto the pitch and the man in the middle, with a look at referee signals. 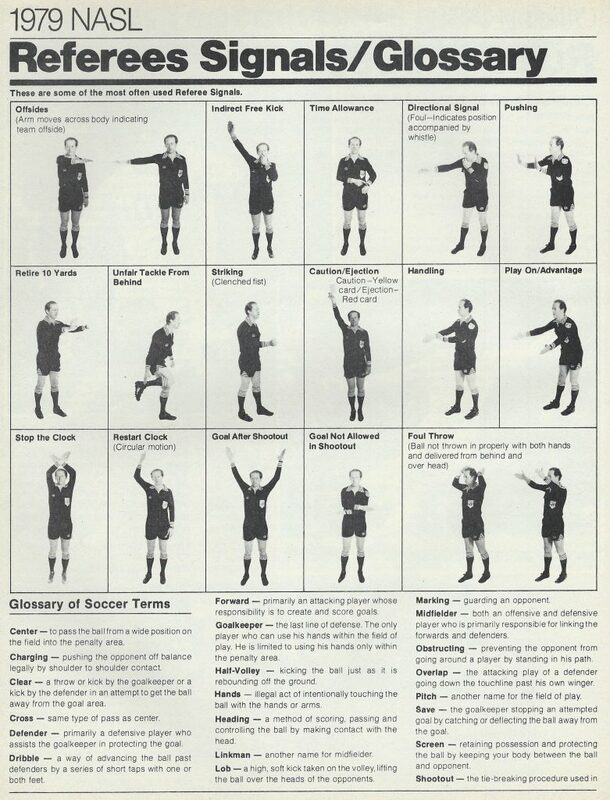 In many North American sports, the officials let the crowd know what their decision or their call is by way of signals. Whether it’s pass interference in American football, safe in baseball, or slashing in ice hockey, certain refereeing signals are very well known. In football, there’s not that many really in the modern game. You have play on, penalty or no penalty, and an indirect free kick as ones that instantly spring to mind. And now, we have the infamous rectangle of VAR. Back in the days of the NASL though, there were plenty more, as the game took on a very North American feel. In every issue of Kick magazine, the matchday program, there was a guide for fans to let them know what these were. Here’s what they looked like. Nowadays it more the gestures of the fans to the referees for their bad decisions. That’s a photo montage someone really needs to make up!